Durham Bedroom — Shop for deals on furniture, sofas, recliners, dining sets and more! Building your dream bedroom has never been easier with Durham. From the little town of Durham, Ontario, Durham’s reputation for quality and value started in 1899. Durham’s recognition would skyrocket in 1948 when Eaton’s commissioned the company to produce a gift for the newly married Princess Elizabeth and Duke of Edinburgh. The result was a solid maple panelling and specially designed furniture in the “Canadian Room” in Clarence House, the young couple’s home in London, England. Today, Durham is North America’s leading manufacturer of solid wood furniture. Durham products are distinguished by exceptional quality, award winning designs, and enduring value. Each piece is handcrafted from 100% sustainably harvested cherry, maple, or ash, no veneers or particle board, just nature’s own uniquely beautiful creation. Cherry wood has a lovely grain definition and stains marvellously, allowing you to choose from deep, rich tones for a traditional or natural look for electric or contemporary designs. Maple is prized for its hardness, strength, and great character. Durham finishes their product with a warm finish that adds charm and comfort to any room. Ash, known as the “wood of the Gods” in ancient Greece, is strong and supple and is used for the interior structural components of Durham furniture. Choose the Prominence Bedroom collection for a sophisticated design that commands attention from every angle, solid maple offers you an elegant, timeless look fit for the bedroom. Modern Simplicity appeals to Millennials who are ready to invest in beautifully designed solid wood furniture with crisp geometric and urban-inspired details. Cascata sparks the imagination while soothing the soul. Cascata is dramatic like a cascading waterfall, yet quietly urban in design. The dramatic symmetrical curves of this collections concave drawer fronts and side are defining design elements. The Defined Distinction collection is strong and sleek with a minimalistic look, while the Distillery Collection has an antique, rustic vibe with its cedar-bottom drawers and side-tapered square legs. Add a nightstand, dresser, and a king, queen, twin, or single size bed to complete your entire bedroom look. 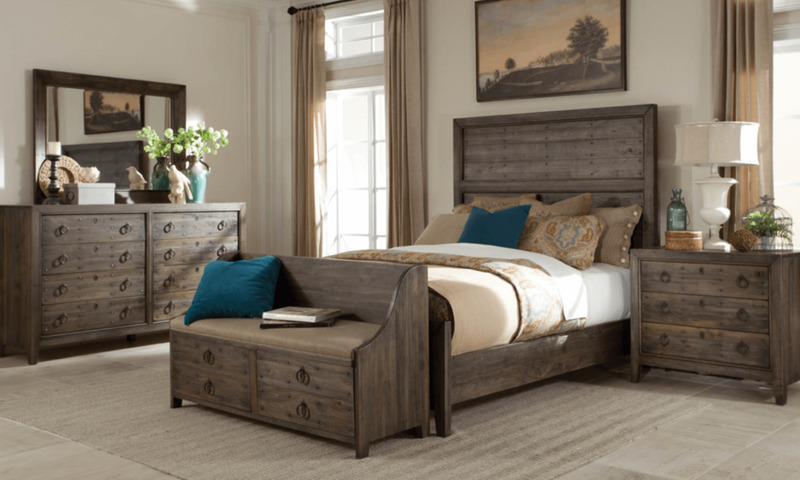 Durham Furniture has a proud legacy or quality, integrity, and dependability, placing them amongst North America’s premier fine furniture selection. A tightly knit family spanning multiple generation, Durham is dedicated to making furniture in an environmentally sustainable and ethical way. Bring home the exclusive feel comparable to luxury hotels when you purchase a piece of Durham solid wood furniture.